In Texas, students are now expected to finish some assignments using cursive lettering by the fifth grade. In many schools today, the traditional pen-to-paper notetaking has been replaced with tablets and personal laptops. At the front of most classrooms, where giant blackboards were once the focal point of teaching, there are now whiteboards and screens on display. Now, in a time when schools are utilizing more and more technology in education, some have argued that the age-old practice of cursive is a dying art. Or is it? More and more schools are encouraging their students to practice penmanship, with some states revising educational curriculums to reintroduce cursive handwriting into classrooms. This month, educational officials in Texas unveiled a new education code that will require second graders to learn how to write cursive letters and, by the third grade, Texas officials hope their students will be able to "write complete words, thoughts, and answers legibly in cursive writing leaving appropriate spaces between words." In the fourth grade, students will be required to "write legibly in cursive to complete assignments." Texas isn't the only state to pass legislation requiring updated teaching plans. In 2016 and 2017, Alabama and Louisiana passed laws mandating cursive proficiency in public schools, the latest of 16 states that require cursive. And in 2016, New York City (the nation's largest public school system) encouraged the teaching of cursive to students as part of a third grade curriculum. Take notes from St. Anne's Academy in White Bear Lake, Minnesota, which has not forgone the practice of cursive penmanship in their curriculum. Truly, teaching cursive is something they pride themselves in. Every lesson the Sisters teach at St. Anne's is scrawled out across (yes, a blackboard with chalk) in cursive handwriting. In fact, St. Anne's practice of teaching this particular form of writing is helping to renew the somewhat neglected form of handwriting. "It shows education," says Sister Maria Magdalena, a teacher at the school. "The flow and neatness say something about the mind and the person." While some may have a natural knack for the series of swirls, loops, and quick lines of cursive, others have to practice a bit more diligently. 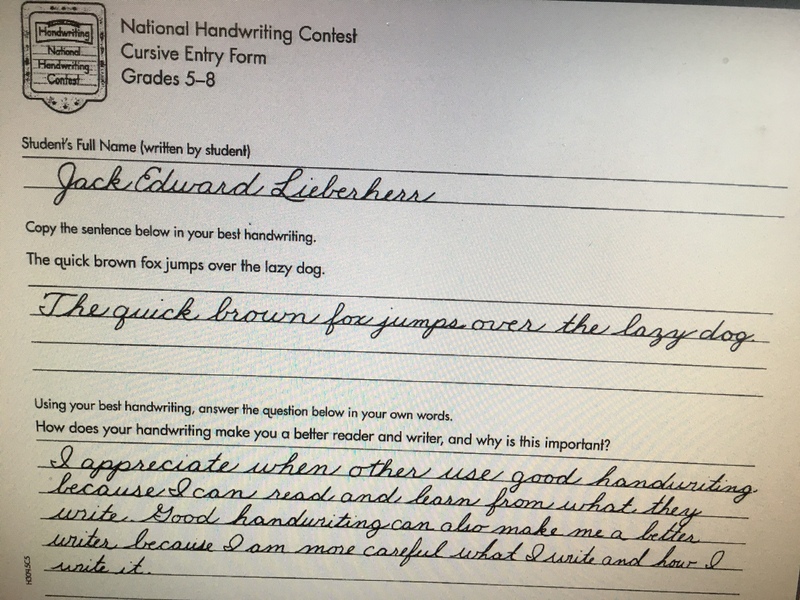 St. Anne's method of introducing cursive handwriting into the students' studies is paying off as one of their own, Jack Lieberherr, 15 took home the title of "Grand Champion" for eight graders in the Zaner-Bloser National Handwriting Contest back in 2016. Jack, who says he practices his handwriting daily, also won the title when he was in the sixth grade. Jack's writing talent was judged based on the spacing, size, and slant of his words. In addition, he won $1,000 awarded to his school for educational means as well as $500 for himself, accoring to the Pioneer Press. Other past and current students of St. Anne's have been praised and acknowledged for their beautiful penmanship as well. It's not uncommon for grade schools to have removed the teaching of cursive entirely from their curriculum. However, schools such as St. Anne's are doing their part to keep the stylized lettering significant. By admiring Jack's handwritten submission for the 2017 Zaner-Bloser National Handwriting Contest, it's apparent that just because something is considered "old school" does not necessarily make it unsignfiicant. The debate of whether or not more schools will start adding cursive back into the classroom remains present. Hopefully, with more students like Jack perfecting their penmanship will inspire others to pick up their pencils too. Switch Up This Sweet DIY!